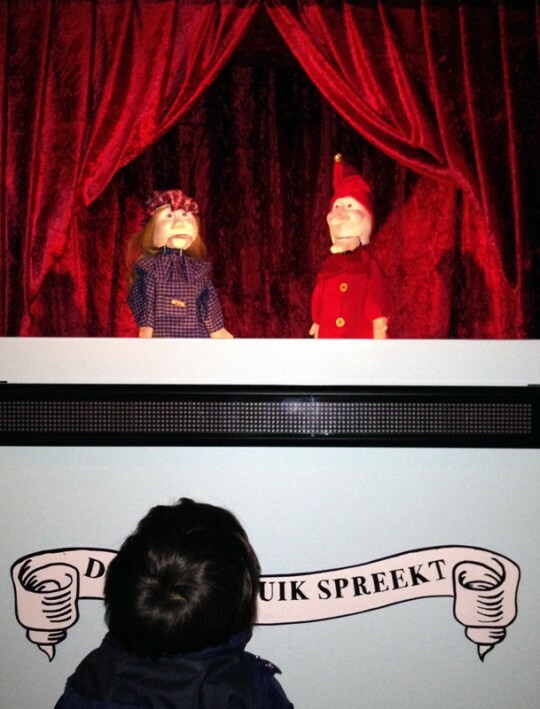 Jan Klaassen and Katrijn play nujij.nl in a fully automatic puppet theater. Nujij.nl is one of the largest online news forums. People, often anonymously, give their opinions on all sorts of news articles on the Internet. They discuss, talk, swear and hate. The puppets Jan Klaassen and Katrijn play these dialogues, real time and automatically. Puppet theater is an absurd theater play. 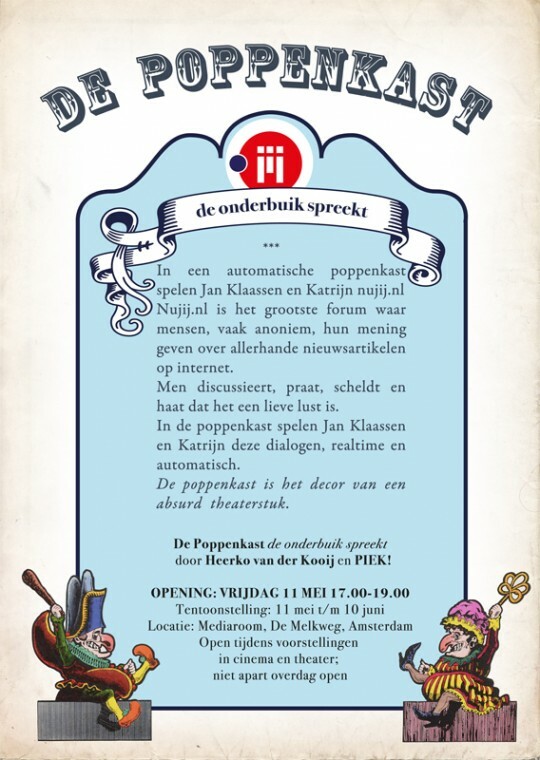 A mechanical puppet theater with the main characters, Jan Klaassen and Katrijn (the dutch equivalent of Punch and Judy**, the german Kasperle, the french Guignol and originally a character from Pulcinella). 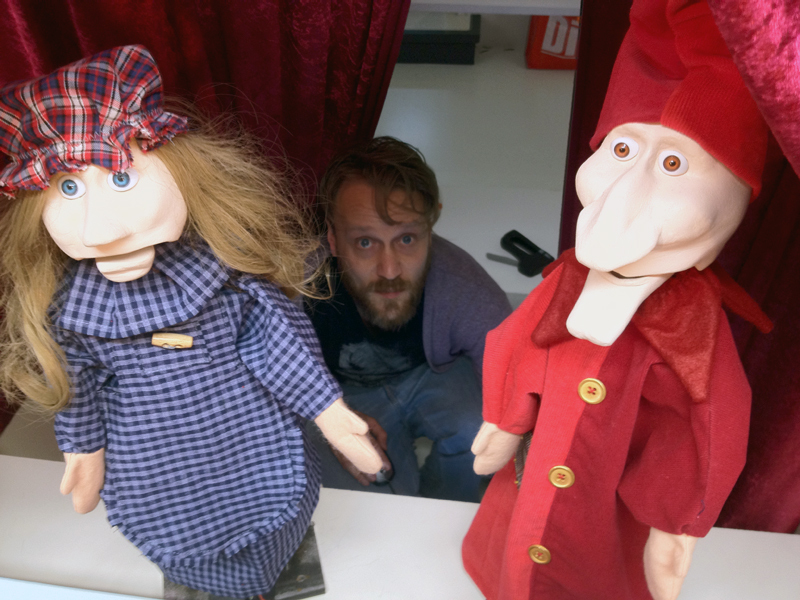 These puppets will act in a play with lines taken from news forums on the internet. Software (developed by us) will scrape and collect news forums for conversations and dialogs. These texts are converted by a speech generator to voices (sound) and will be automatically played by electrically powered puppets; Jan Klaassen and Katrina. NUjij.nl* is the largest social news site in the Netherlands, where everyone can give their comments on the news. Lively discussions and angry messages alternate. They talk, shout, discriminate hate and scold. One could call these conversations a grotesque form of dialogue, with an atmosphere of unsung people who have found a platform where they can express themselves and make themselves heard. Argumentation and / or reading other people’s contributions seems less important. These flawed and strange conversations are transposed to another podium/forum: the puppet theater. 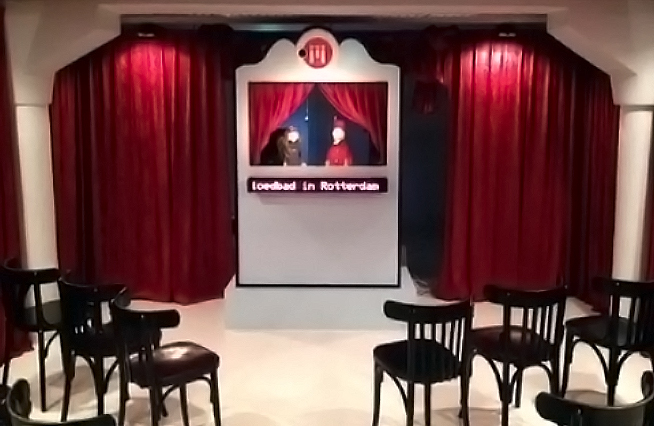 The play is set in a large traditional puppet booth. Using speech software, the conversations of the forums are read alout. 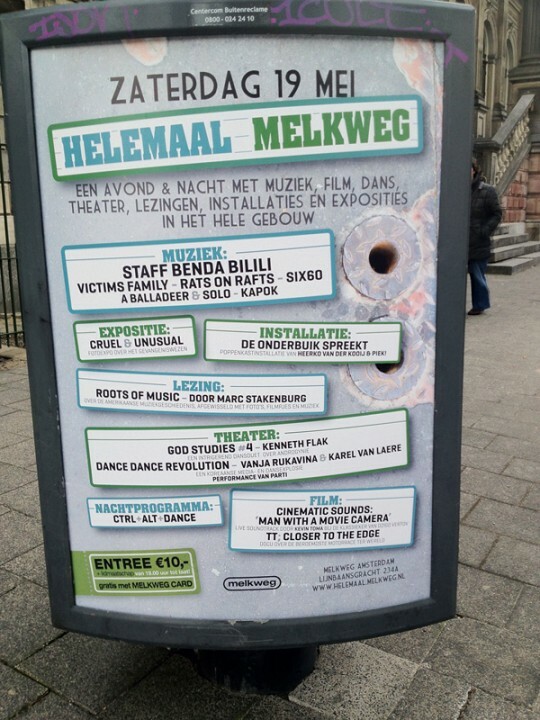 Jan Klaassen and Katrijn will play these dialogues, real time and automatically. Using servo motors, the dolls will move ‘lifelike’ and talk. In this way, this puppet show will be an ongoing scene in an absurd play. The theater will continue to renew scince on average, every minute a new message is posted on nujij.nl is placed. The software constantly looks to the most lively and topical discussions. 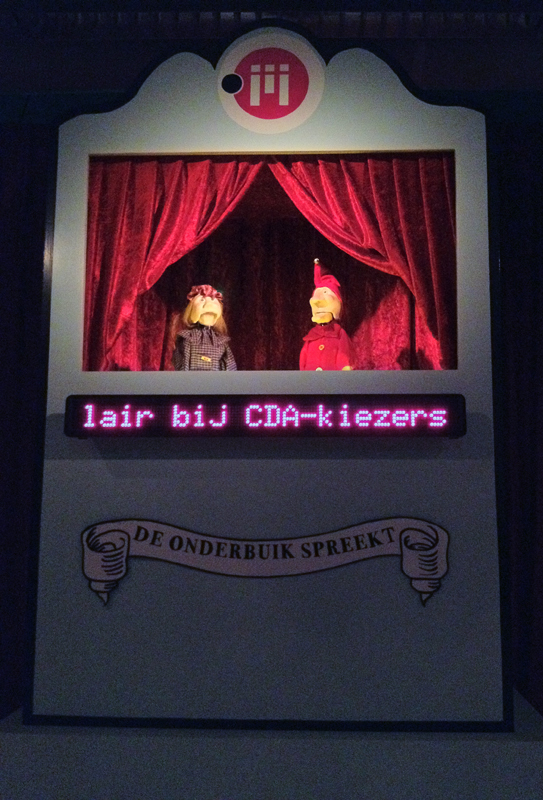 When a discussion is finished, the puppets will automatically play the next debate. Our fascination for these forums: what do all these online contributions mean in the ‘real world’ and what way ressembles this online world the ‘real world’. Why are there on the forums other social codes and manners than in the real world. Should we be worried about the online hordes?